Asian stock markets extended their rally Tuesday after Wall Street surged on hopes a U.S. plan to rid banks of festering debts at the heart of the financial crisis will revive growth. 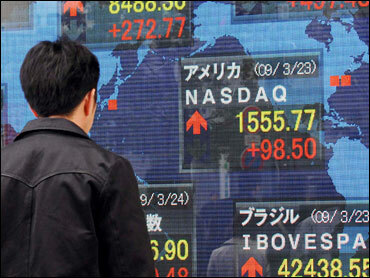 European markets were mixed in early trade. Investors worldwide appeared heartened by the Obama administration's move to clean up as much as $1 trillion in toxic securities and loans weighing down bank balance sheets - a key part of the government's arsenal aimed at restoring consumer and company lending so crucial to economic activity. "Investors are somewhat upbeat about prospects for this plan having a positive impact on the economy," Hugh Johnson, Chairman and CIO of Johnson Illington Advisors, told CBS News. Johnson told CBS News that while he doesn't read the messages as it being time to completely shift from a somewhat guarded or defensive portfolio to "an all-out, bull market portfolio, but at least we can start to work our way in that direction." A dose of better-than-expected news about the other big U.S. economic problem - the housing slump - added to the upbeat mood. Data showing a surprise increase in home sales fostered hopes the hard-hit housing industry might finally be stabilizing. But analysts cautioned investor sentiment, while recovering in the short term, was still fragile. Doubts about the U.S. plans - about how to price the assets and account for losses, among other issues - could smother in the coming days what many believe is still an abridged rally in a longer bearish trend. "At the end of the day there has been no game changer even if the plan is implemented perfectly. And that's an enormous 'if,"' said Kirby Daley, senior strategist at Newedge Group in Hong Kong. Indeed, Wall Street was poised to give up some of its gains in trading Tuesday after U.S. futures fell. S&P futures were down 6.9 points, or 0.8 percent, to 810.4.